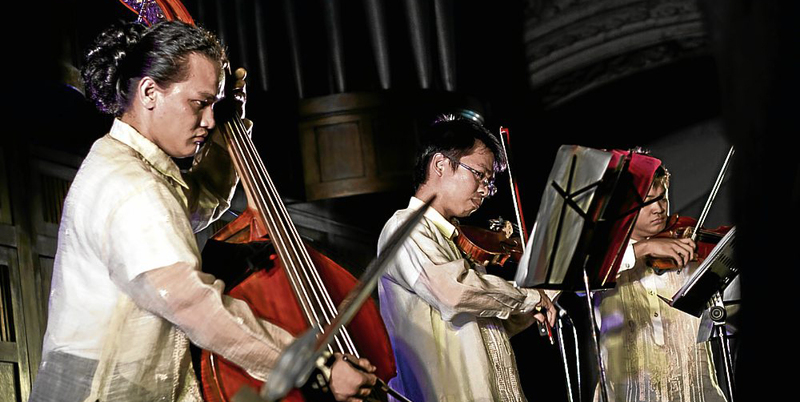 From its very beginning, the Cathedral of Manila was provisioned remarkably well for music. The first bishop, Domingo de Salazar, O.P. (1512-1594) brought with him not only music manuscripts, but various musical instruments as well, including the first pipe organ of the Cathedral in 1581. Unfortunately, the pipe organ (a portable box organ) did not survive the fire that consumed much of old Manila on February 19, 1583. Another pipe organ was probably built during the construction of a new Cathedral in 1594, with then Governor General Dasmariñas allocating some funds for the instrument. The earthquakes of 1599 and 1600, which almost completely destroyed the Cathedral, might have destroyed as well the entire pipe organ or parts of it. Documentation of a list of individuals who served as Chantre (Master of Music) in the Cathedral of Manila between 1581 and 1755 has been made, with some of them explicitly called “organist.” The first Chantre to be formally named organist was Simon Ambrosio (1724). And as early as 1582, a Colegio de Tiples had been established to provide for the musical needs of the Cathedral, and was probably the breeding ground for many future church musicians in the day. In the 200-year period of service this choir provided, it must be presumed that a pipe organ was consistently present, reconstructed, or repaired every time the Cathedral had to be rebuilt or renovated due to earthquakes or other calamities. The coming of the British opened the doors for foreign entrepreneurs to engage in business, resulting in prosperity growing in Manila. Trade was stimulated with the Charles III's ascension to the throne in 1759, who was an articulate advocate of the Enlightenment. It is in this context that larger pipe organs begin their appearance in the city of Manila. Around the same time, in Spain, a large organ would have always had a huge battery of reeds. From 1802-1804, the famous Bamboo Organ builder, Fray Diego Cera, was commissioned either to construct a new pipe organ in the Cathedral, or to do a general repair of the existing one. Sadly, the Cathedral was again severely damaged by the earthquakes of 1852 and 1863, probably rendering the organ unplayable thereafter. In the book “Interesting Manila” written by George Miller in 1912, he described the Cathedral pipe organ as the most modern organ in the city, with old parts from the 18 th century. Based on these descriptions by George Miller, it is highly probable that the pipe organ was just restored and improved during the reconstruction of the Cathedral in 1879. It is highly probable that such work was done by a local organ building firm. In 1913, a new organ was constructed for the Cathedral by the famous French firm Cavaillé-Coll. The firm, which was then under Charles Mutin, had previously installed a number of organs for various Cathedrals in Latin America. Unfortunately, the Liberation of Manila during the Second World War left the Cathedral in ruins, and along with it the precious pipe organ. In 1958, through the efforts of His Eminence the late Cardinal Santos, the present pipe organ was built for the Cathedral of Manila. The Manila Cathedral-Basilica Pipe Organ was built in 1958 by the Dutch organ-building company Pels & Zoon, and was erected by Mr. Jose Loinaz of Manila and P. Andriessen of Holland. It has four manuals and pedal -- 61 straight stops, 9 pedal expensions, and 16 couplers, and is made up of more than 5000 pipes. It is the largest pipe organ in the Philippines, and the largest church organ in this part of the world. 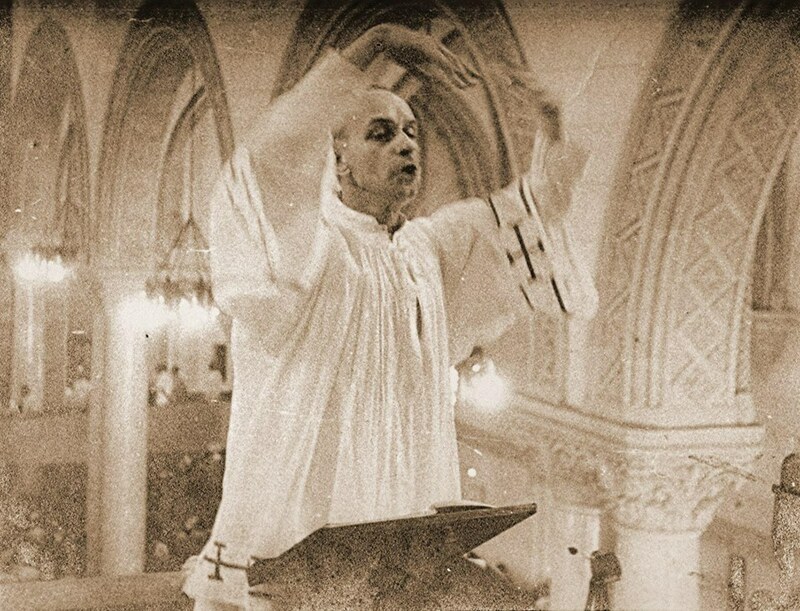 The 1958 inaugural concert was led by the world-famous Belgian organist Flor Peeters, while among the organists who have actively played on the pipe organ thereafter are John Van de Steen CICM, Alfredo Santos Buenaventura, Amador Hernandez, and Atty. Jose Flores Jr. (titular organist of the Manila Cathedral Organ from 1979-1989). Several concerts were also held in the 60s and 70s, featuring foreign organists like Odile Pierre of France. Re-leathering of the pipe organ was done in 1979, and the addition of the fourth manual was completed in 1989 by Javincello and Co., Inc. 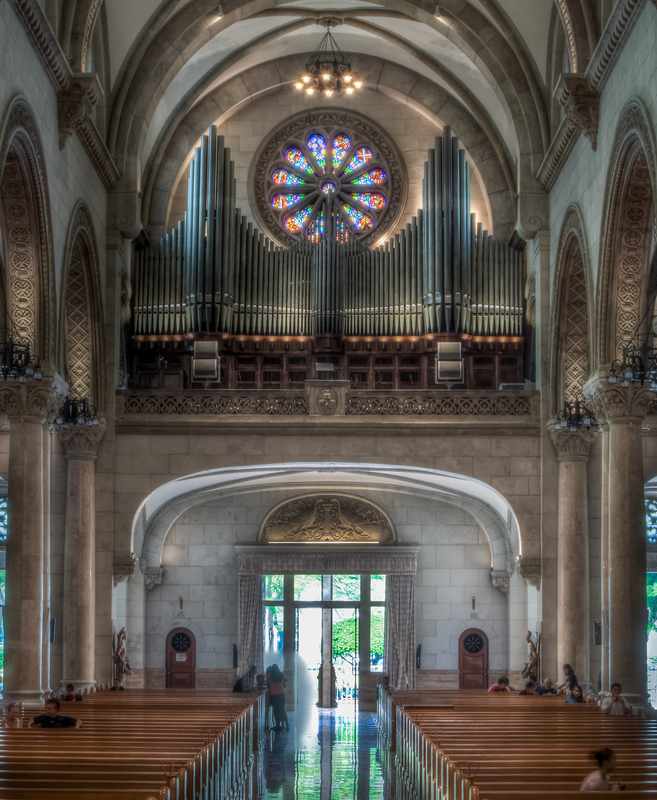 The absence of a competent organist in the 1990s led to the fast deterioration of the pipe organ, until the pipe organ could only be played with limited stops, the controls to which can only be activated using the pre-set stops. One cannot draw each stop individually, which made it impossible to tune. In the end, only two manuals were somehow working, with a lot of missing notes. In the late part of the year 2004, a contract was signed with the Diego Cera Organbuilders, Inc. of Las Piñas for the general overhaul of the Cathedral organ, through the initiative of then-Cathedral rector Monsignor Nestor Cerbo. Disassembling the pipe organ was started in January 2005, and by March, all windchests, bellows, and the console were brought to the shop of the Las Piñas firm for their complete overhaul work. A new note-switching system was also installed in the console, in compliance with the latest organ-building methods. After two years of rehabilitation, the Manila Cathedral was once again graced by the wondrous music of its pipe organ. The blessing of the pipe organ was held on December 1, 2006, presided by His Excellency, the Most Rev. Broderick Pabillo, D.D. 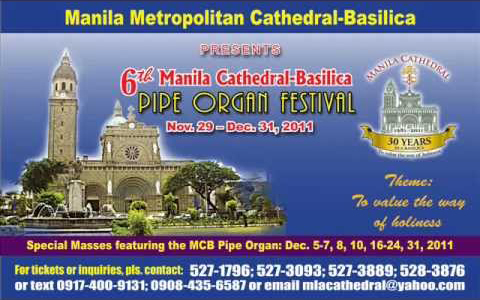 To show the true purpose of the pipe organ in the liturgy, the first Manila Cathedral-Basilica Pipe Organ Festival was held from December 1 to 10, 2006, featuring Belgian organist Luc Ponet and Filipino organists Jose Flores Jr. and Armando Salarza. The Pipe Organ Festival had become an annual event for the Manila Cathedral. Exploring the great musicality the pipe organ can offer, during the 2nd year of the festival, a new Filipino mass composition in honor of Mary, the Immaculate Conception was launhed – the “Misa Inmaculada Concepcion” by Alejandro Consolacion II, as commissioned by the Manila Cathedral. On its 3rd year, the Austrian organist Dr. Johann Trummer graced the festival with a performance during the gala night. In the same occasion, a choral competition was held, in which the Lyceum of the Philippines Chorale bagged the grand prize. The 4th MCB Pipe Organ Festival set another milestone for the Cathedral as the Philippine Philharmonic Orchestra, joined by well-known solo performers and a 150-member choir, added color to the majestic sound of the Manila Cathedral Pipe Organ, with world-renowned Austrian conductor Dr. Ernest Hoetzl at the helm. From the usual reasons of celebrating among others the Solemnity of Mary, the Immaculate Conception, the patroness of the Manila Cathedral, on December 8, and the Solemnity of the Dedication of the Manila Cathedral on December 10, the 5th MCB Pipe Organ Festival Gala Concert went beyond to widen the Manila Cathedral's role in history, culture, and arts by connecting with the performing groups of the different Catholic conservatories and colleges of Music in Manila. The Manila Metropolitan Cathedral-Basilica Foundation, Inc., the organization behind the staging of the gale concert, established such synergy to highlight historic milestones as well, like the 70th anniversary of the St. Paul University-Manila College of Music and Performing Arts, the selection of the Philippines as the First Asian Culture Capital, and the Dia del Galleon. Aiming among others to celebrate the 30 years of the Manila Cathedral as a Basilica, the 6th MCB Pipe Organ Gala Concert was specially dedicated as a tribute to both the incoming Archbishop of Manila, His Eminence Luis Antonio G. Cardinal Tagle, D.D., and the outgoing Archbishop, His Eminence Gaudencio B. Cardinal Rosales, D.D. 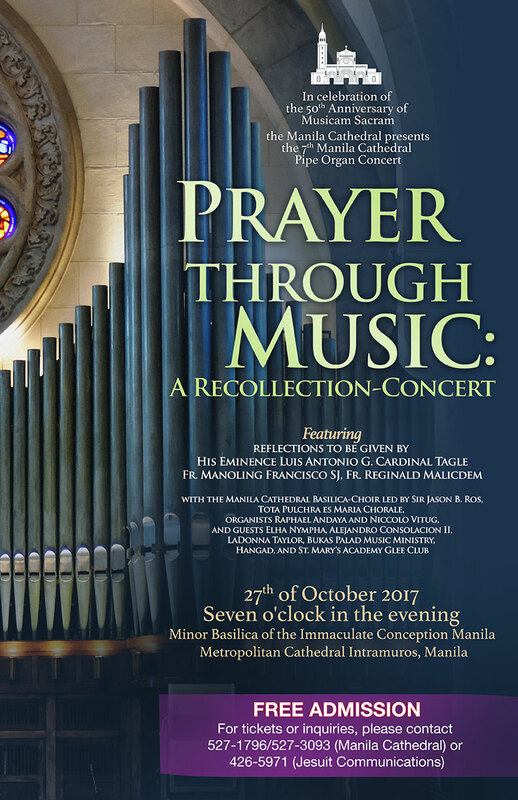 The concert was participated in by the homegrown talents from the Manila Cathedral-Basilica Institute of Liturgical Music, together with noted pipe organist Prof. Armando Salarza, and other selected instrumentalists. Jose Mari Chan, a famous singer and songwriter, and Myramae Meneses, 2010 winner of the National Music Competitions for Young Artists (NAMCYA), were the featured performers, with Mr. Ferdinand Bautista as conductor and composer. The cultural event also continued its tradition of promoting Church music through the launch of new liturgical compositions, as it featured new Christmas and wedding mass songs by Mr. Bautista. After the 6th Pipe Organ Festival, the more than half-century old Cathedral was closed for retrofitting and much-needed structural repairs, and with this closure, the Manila Cathedral Pipe Organ remained silent and unused except for playing maintenance. Two years later, in 2014, the Cathedral was reopened and the majestic music of the pipe organ was heard once more in various liturgical celebrations, the most noteworthy of which is the Apostolic Visit of Pope Francis to the Philippines in 2015. 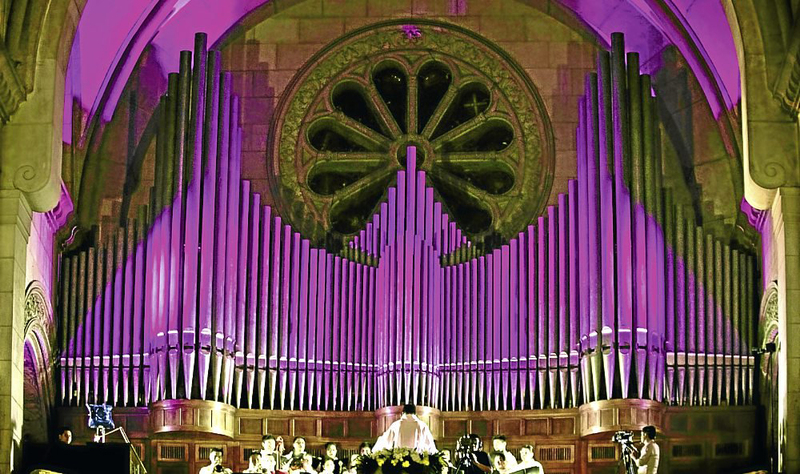 This year, the Manila Cathedral Pipe Organ is highlighted as liturgical and performance instrument in the 7th Manila Cathedral Pipe Organ Concert, which is centered on the 50th Anniversary Celebration of the issuance of the Instruction on Sacred Music in the Liturgy Musicam Sacram.